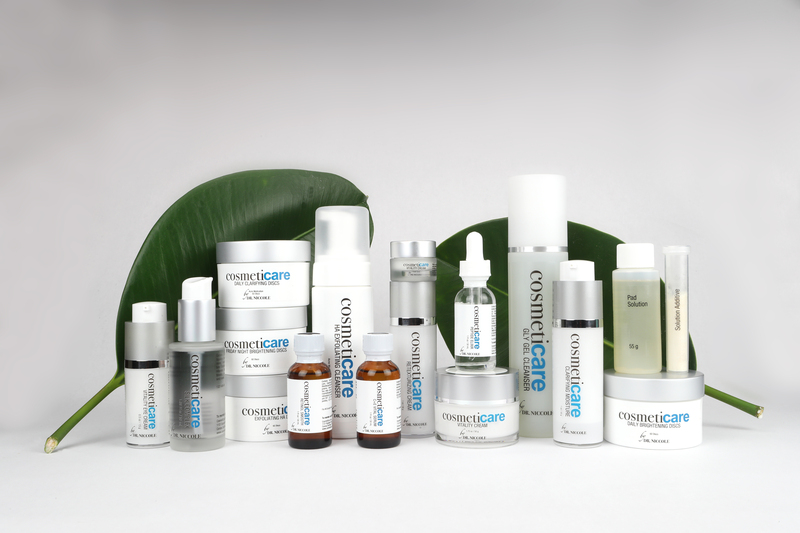 Introducing the new CosmetiCare skin care line: medical-grade skin care developed by world-renowned plastic surgeon, Dr. Michael Niccole. At CosmetiCare, we are proud to offer the perfect match of customized medical skin care for our patients' specific needs. Ask for a skin assessment at our Newport Beach practice and receive a tailored skin care plan from our team of experts. It's time to love the skin you're in! An exfoliating alpha hydroxy acid cleanser that helps remove dirt and excess lipids without over-drying the skin. This product contains 10% glycolic acid to enhance exfoliation. Gentle sugar-based detergent system removes surface lipids and debris without disrupting the skin's natural moisture barrier. Medicated cleansing foam that contains 2% salicylic acid combined with glycolic acid. This product helps remove excess surface lipids without over-drying the skin. Contains anti-bacterial agents and tea tree oil. Brightening exfoliator that contains 7% azelaic acid, 5% lactic acid and 3% phytic acid. Easy-to-apply disc facilitates uniform application to broad skin surfaces to reveal a more radiant and even-toned complexion. Gentle cleansing disc that simultaneously offers light exfoliation to reduce the appearance of oily skin. Easy-to-apply disc facilitates uniform application to broad skin surfaces to reveal a clean, fresh face. This advanced formula brightens and smoothes skin texture while improving the appearance of fine lines and wrinkles. Contains 0.2% hydroxypinacolone retinoate, an advanced retinoic acid ester that provides retinoid benefits with less irritation. Robust anti-oxidant benefits are also provided by Vitamin C + Vitamin E + Ferulic acid ester. Retinoid-free skin enhancement that wraps skin in hydration, helping to improve the appearance of skin tone and texture. Formulated with barrier enhancing lipids, plus fortified with anti-oxidant Vitamins C and E, ferulic acid ester and unique texture-enhancing peptides. High-potency combination of ingredients clinically demonstrated to improve the appearance of delicate skin around the eyes. Advanced barrier technology combines ceramide, cholesterol and fatty acids for improved hydration. Reduces the appearances of dry skin, dark circles, fine lines and wrinkles. High-potency combination of Vitamins C and E and ferulic acid ester combined with a mild keratolytic agent in an easy-to-use serum. Repairs the damaging effects of the sun by reducing new pigmentation, improving skin tone and texture, and creating brighter, healthier skin. A unique hyaluronic acid-based, oil-free serum designed to enhance skin moisture and improve the appearance of fine lines and wrinkles. Fortified with niacinamide (Vitamin B3), green tea extract and soothing Vitamin B5. Ideal daily sun protection for patients with dry or sensitive complexions. This product combines nourishing moisture and a sheer tint to let skin shine through while boosting the appearance of radiance, combating dullness, and providing SPF protection. Ideal daily sun protection for patients with combination to oily skin. This light tinted moisturer offers beautiful mattifying benefits while providing necessary SPF protection.